Posted on February 1st, 2013 at 11:14 am. 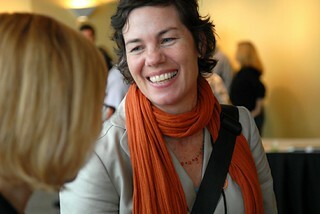 Alison Graves at the 2010 Oregon Bike Summit. 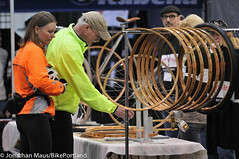 Alison Graves announced to staff this morning that she is leaving the non-profit Community Cycling Center. 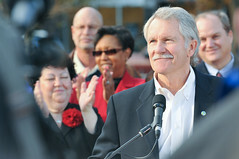 Graves has been with the organization for seven years, serving the last three as executive director. Her last day will be March 14th. Current Deputy Director Anne Lee will be the CCC’s interim director and the organization will begin the search for a new leader in March. Posted on January 31st, 2013 at 10:39 am. Posted on January 28th, 2013 at 11:33 am. 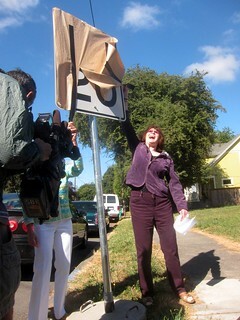 The Portland Bureau of Transportation (PBOT) is gearing up to install 300 new speed limit signs throughout the city. The new signs are the result of a law PBOT passed in 2011 that gives the city legal authority to lower speed limits by 5 mph on residential streets that have been specifically designed as bikeways (a.k.a. 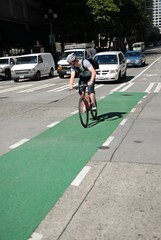 neighborhood greenways). Since these neighborhood greenway streets are already at 25 mph, the new law allows PBOT to set the new limit at 20. Posted on January 25th, 2013 at 4:43 pm. 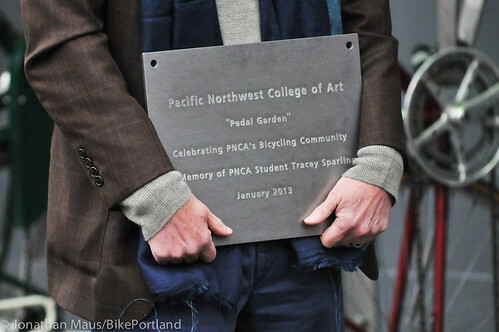 PNCA President Tom Manley holds a plaque that will be mounted near the Pedal Garden. Posted on January 25th, 2013 at 9:40 am. 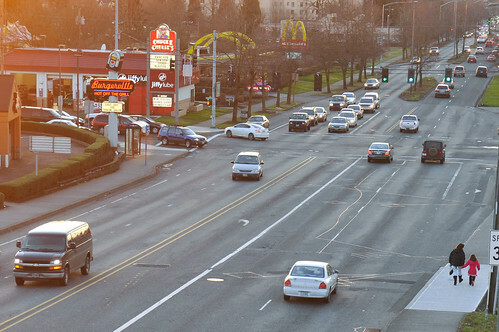 SE Powell, a wide and intimidating arterial known for its safety problems, is one of the three corridors PBOT will look to tame in 2013. Posted on January 24th, 2013 at 12:02 pm. Posted on January 23rd, 2013 at 12:15 pm. Seattle wants more of them. 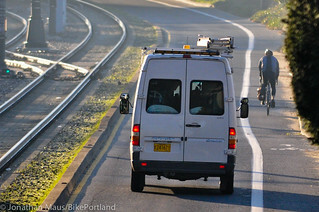 An ongoing “bike backlash” and “war on cars” pushed by the local media, biking as a wedge-issue in political campaigns, fear from politicians about doing “too much” for bikes — sounds like Portland right? Well, Seattle (not to mention New York City and many others) suffers from the same illusion. Now, a new survey commissioned by Seattle’s Cascade Bicycle Club could help tamp down this pervasive — yet false — narrative. According to a memo (PDF) about the survey from public opinion research firm Fairbank, Maslin, Maullin, Metz & Associates, the results provide, “absolutely no evidence of widespread anti-cycling sentiment in Seattle.” The memo goes on to explain that (among other things) 78% of those surveyed ride a bike at least once a year, 45% ride monthly, and 60% say they’d like to ride more*. Posted on January 22nd, 2013 at 3:32 pm. The City of Portland Parks & Recreation bureau continues to come under fire for their work on the North Portland Greenway Trail project. PP&R is in the process of designing the route of the paved path that will connect Kelley Point Park north of St. Johns to the Eastbank Esplanade in the central city. However, as we reported last month, many people are disappointed by the chosen alignment in the trail’s southern portion. Instead of staying along the Willamette River and creating a path away from auto traffic, PP&R has focused their efforts on what they consider a “near-term buildable” route on sections of busy, and sometimes narrow surface streets. 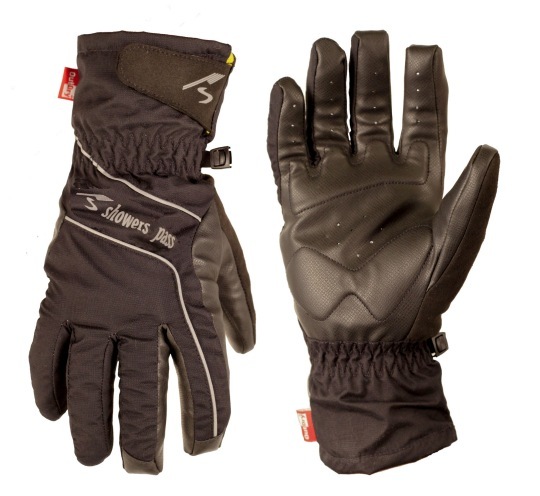 The route, critics say, fails to live up to the vision and promise of the trail. Posted on January 22nd, 2013 at 1:43 pm. Posted on January 18th, 2013 at 11:39 am. now there will be cool used stuff too!